Honeycomb Canyon, Solitude Mountain Resort. How do you make a great family ski resort better? In April, Deer Valley Resorts finalized the purchase of Solitude and began announcing upgrades and changes for the coming season. These include a new detachable high-speed quad (replacing the old Summit lift), a new run from the top of the Apex Express to the bottom terminal of the realigned Summit Express (for quicker laps in Honeycomb Canyon) and an overhaul of the resort’s dining (including an update of the Moonbeam Restaurant and on-mountain Himalayan food — think curry and naan — at the “Himalayan Hut” in the Roundhouse). Say goodbye to this old lift. The 2 person Summit lift is now a realigned high-speed quad. Solitude Mountain Resort was already a great place – especially for families. Since opening in 1957 with two chair lifts, Solitude has grown to 77 named runs within 1,200 acres spread across three bowls, on a mountain served by 8 lifts. Forty percent of the runs are rated intermediate, making Solitude a fantastic destination for local day skiers and out-of-town visitors alike. Solitude has two base areas: Moonbeam and the Village. Moonbeam is ground zero for families with loads of parking, a comfortable day lodge, a cafeteria, an outdoor brown bag patio, one of two rental shops and the Moonbeam Ski and Snowboard Academy for kids and adults. In a quest to make lessons less like school, the Snowsports Academy focuses on fun, learning-based games and small group sizes. Childrens’ lessons are walk-in only. They don’t take reservations. The Moonbeam base is also where visitors will find almost all of the resort’s beginner terrain. Utah is known for steep terrain and challenging skiing, and Solitude is no different with 50% of it’s trails rated advanced or expert and about half of its skiable acreage found in the double-black heaven of Honeycomb Canyon. Still, from the top of the Moonbeam chair, the terrain is gentle and forgiving, a perfect place to learn and explore. And when you’re ready to move on, the primarily intermediate Eagle Express will keep you busy, and on blue runs, all day. While the Moonbeam base is the focus for day trippers, the Village at Solitude is really what sets this resort apart. I think the Village is unique among Utah resorts, especially those near Salt Lake City in the Cottonwood Canyons. The Village at Solitude Mountain Resort. While the skiing is notably fantastic at each of the Cottonwood Canyons resorts (Alta and Snowbird in Little Cottonwood Canyon, Solitude and Brighton in Big Cottonwood Canyon), only Solitude has a true base village with lodging, restaurants, rentals and a bit of retail shopping. There’s also an ice rink, Club Solitude with a large heated pool, hot tub, exercise and game rooms, the Solitude Mountain Spa and access to 20 k of cross-country trails maintained by the Solitude Nordic Center. A map of Solitude’s nordic and snowshoe trails. We stayed in the Village for the second time in early March. Both visits, the first when the boys were much younger and then this one, have been massively successful. Driving back to Colorado after our recent visit, I asked my son and husband to describe their favorite parts of the weekend. 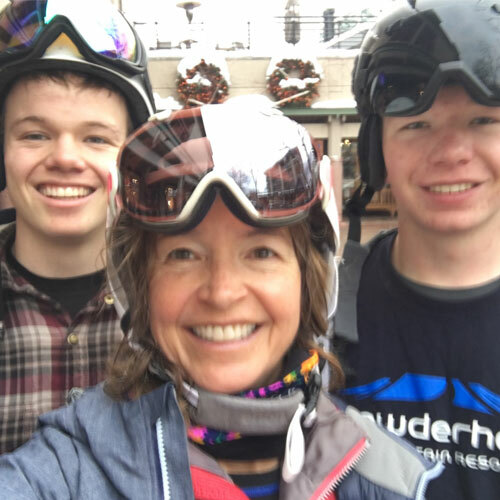 While my 15 year-old was all about the skiing, calling out the exhilarating steeps, the well-spaced trees and the good snow, he also had high praise for the roomy condo, which although in the building furthest from the Apex Lift, was only about a 2 minute walk from snow. My husband was even more enthusiastic about the “tiny, intimate” village (his words) where everything is so convenient. With five restaurants, ranging from a pizzeria and creamery (try the brownie sundae) to elegant St. Bernard’s in the Inn at Solitude, you won’t go hungry. We’ve stayed in two Solitude condos, the first in the Powderhorn building and this time in Eagle Springs, and both have had fully stocked kitchens, where it’s a pleasure to cook. A small general store in the Village provides basics, or it’s a quick 30-minute drive down the canyon to a multitude of shops in Cottonwood Heights and Sandy. But really, it’s better to plan ahead and bring what you need. Because, once you get to Solitude, you won’t want to leave. It’s just too easy, too relaxing and too much fun. Whether you’re skiing wire-to-wire, enjoying drinks outdoors in the Village at the Library Bar and Honeycomb Grill, or skating and snacking on s’mores as the sun goes down, we think you’ll agree with us, that Solitude is one of Utah’s best family resorts. We love skiing in Utah and enjoy all of the resorts we’ve visited. Still, the Village at Solitude is special, especially if you’re there to ski and ride, bond with the family and enjoying one another’s company in a low-key, absolutely no-stress setting. While your choices are limited at Solitude, there are no bad choices. From dining to lodging to Club Solitude, we’ve found it all enjoyable. And, you actually have tons of options when it comes to skiing and riding. Connected to Brighton by the skiable Sol-Bright trail, a two mountain ticket costs just a bit more than a one resort ticket and doubles your options with 2225 skiable acres, 130 runs and access to Brighton’s extensive terrain park scene. Brighton also has night skiing, Monday through Saturday from 4:00 – 9:00 p.m. Looking from Solitude to Brighton. Possibly the best way, however, to capitalize on your Solitude vacation is to pair it with a few days at Deer Valley in Park City. Enjoy two of Utah’s finest ski resorts, relax and regroup at Solitude and then dive into the countless diversions of Utah’s only ski town. If you’re a snowboarder, you’ll want to stick to Solitude Mountain Resort. Boards are not allowed at Deer Valley. Fun Family Times at Utah’s Deer Valley Resort, March 5, 2014. Finding Solitude (and a Whole Lot More) in Utah, December 16, 2011. Family Skiing: Making Memories at Resorts in the Southeast and Deer Valley, Utah, August 25, 2014. © 2015 – 2019, braveskimom. All rights reserved. Any use or publication of content, including photos, requires express permission.